- AJPW Real World Tag League '84 (November/December) = Mike Shaw & Tiger Jeet Singh competed in the league, which was won by Genichiro Tenryu & Jumbo Tsuruta. 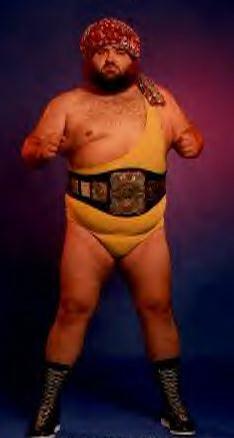 - Calgary Stampede North Amerian Heavyweight Title Tournament (October '86) = Mukhan Singh beat BJ Anis, Mr. Hito, Ben Bassarab, and Owen Hart to win the tournament. - NWA Clash of the Champions VII (June 14, '89) = Norman the Lunatic pinned Mike Justice. - NWA Clash of the Champions VIII (September 12, '89) = Norman the Lunatic fell to Brian Pillman. - WWF Survivor Series '93 (November 24) = Bastian Booger, Bam Bam Bigelow, & the Headshinkers (Fatu & Samu) fought in an "Elimination" Match against the Doinks (the Bushwhackers & Men On A Mission). Booger was eliminated by Mabel. All four 'Doinks' 'survived'. - WWF Royal Rumble '94 (January 22) = Booger was scheduled for the Royal Rumble Match, but no-showed when his number (#25) was called. - Toronto Stu Hart Tribute Show (December 15, '95) = Mukhan Singh defeated the Gothic Warrior.